For my birthday supper last night we dined at Lahore Karahi a small cafe-like Pakastani restaurant in Aberdeen. I have to say my first impressions upon walking in were that the place was warm and cozy, this was made sweeter by the beautiful yellow roses awaiting my arrival to the table, but please let me make it known this was a one off from a feasting friend and not everyone should expect such a greeting! My feasting friend was clever enough to order some starters before our arrival so not long after sitting down we were tucking into lamb samosas, veggie pakoras and these lovely spicy battered mushrooms. Small portions, but definitely enough for the four of us to nibble on whilst we perused the menu. We also enjoyed not one, but two jugs of Mango Lassi at the low low price of £5.50 per jug! It definitely went down a treat and I could have just drank that all night and been happy. But we had to make some decisions and move onto our main courses. We thought the best thing would be to order a variety of dishes (1 each) and pick from each other. The boys went for chicken in the form of a korma and jalfrezi. We ladies opted for the veggie menu with a spinach and lentil curry and I chose a paneer tikka masala (see picture). 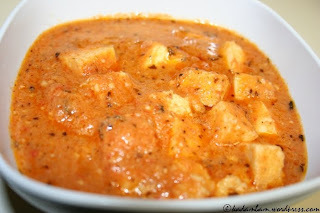 Paneer is a very unhealthy Indian cheese and I have always wanted to try it and I'm glad I did. We also ordered a naan each, I opted for garlic hmmmmmm. Then for the rice, the Keema Biryani was suggested, which was mildly spicy and contained minced lamb. We also ordered a Chana Pilau because I absolutely LOVE chickpeas. This meal certainly delivered! Our waiter was very pleasant and even entertaining at times. What I loved best was how personalised the experience seemed. No matter what dish you wanted, you could have it mild, medium or hot. This was great because no matter what heat you could tolerate, you could experience any one of the dishes on the menu! Everything we ordered was absolutely tasty and my mouth waters just thinking about it! I must also say that the prices were amazing! For four people (we didn't finish all the food and could have easily been supported by a fifth person) we paid less than £60.00!! On the downside, there was a lovely dumbwaiter in the restaurant, which gave the restaurant a very low key intimate feeling which I would have enjoyed if it wasn't for the fact that it occasionally made a horrid screeching noise and could have used some WD40. Some people would also be put off by the fact that the restaurant isn't licensed, meaning they don't sell alcohol. Someone mentioned to me that they thought you could bring your own and possibly pay a small corkage fee, but I would enquire before going to make sure. But we weren't fussed about not being able to have pints with our curry and as stated the lassi was fine enough for me! I would suggest making a booking because when we showed up at 7:30pm there were only a couple tables, but it filled up quickly in the couple hours that were there and as I said, it's 'cozy' but quaint! A good experience overall I would say, and I would suggest it to anyone who loves a good samosa and curry on a chilly winter night!